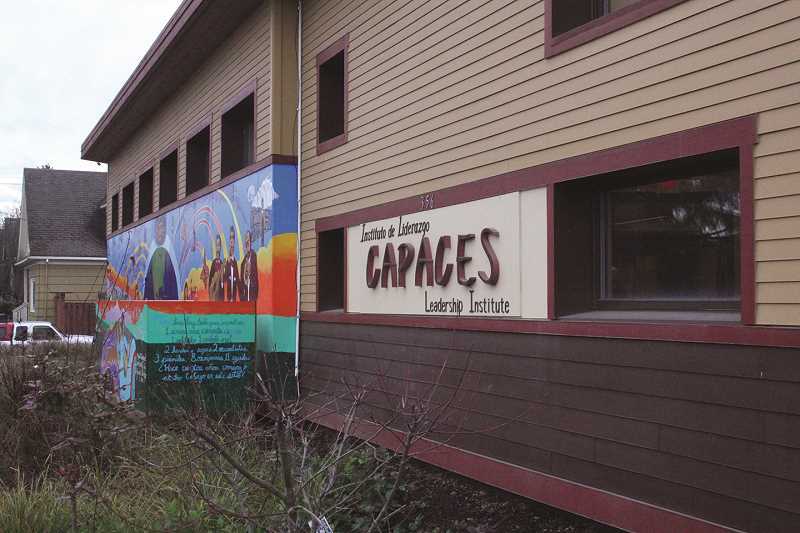 The Oregon Community Foundation gave $50,000 in grants to two Woodburn-based nonprofits in December: CAPACES Leadership Institute and Evolve Workforce & Multi-Family Housing. The two $25,000 grants will be used to create new programming and strengthen existing services provided by the nonprofits. The grant given to CAPACES will be used to start a new program called People's Representative, which will have the mission of helping minorities become equitably represented in local government and other agencies of power. "The minorities are the majority here," Ines Peña, fund development coordinator for CAPACES, said of the Woodburn area. "But that's not represented in the school board or the city council." Since CAPACES is a 501(c)(3) organization, it can't directly help individuals run for office — it's restricted by law in the amount of political activities it can participate in. But Peña said the new program will help develop the leadership skills of those interested in becoming a part of their local government and will also serve as a pipeline to local 501(c)(4) organizations, which are allowed to engage in political activities. Peña said the idea for a program like People's Representative has been on the back burner at CAPACES for a while, but until now the organization didn't have the funding to get the program started. "Without the OCF grant, we probably wouldn't be able to do this," Peña said. Peña said the grant will not only help the program get started, but will also increase the likelihood of the program receiving additional grants from other organizations. "When one foundation supports you, others are more inclined to also support you," she said. For Evolve Workforce & Multifamily Housing, a nonprofit property management company, the OCF grant will aid the nonprofit in strengthening its current operations as well as helping start a training program for farmworkers and their families to begin careers as property managers. Evolve, which oversees 276 Farmworker Housing Development Corporation units, takes a culturally specific approach to managing the publicly funded housing properties. "We have very respectful property management staff," said Maria Elena Guerra, a director of Evolve. Guerra said that for tenants of publicly funded housing units, property managers can sometimes seem more like police than allies or advocates. Evolve's property managers try to take a different approach by respecting the dynamics of the community and working with individuals to solve problems. The OCF grant will help Evolve get a new program started, which will aim to help low-income farmworkers and their families to move out of the farm working industry and undergo training to become property managers. "Most of our farmworkers and their families want to jump into a better way of living," Guerra said. "We're giving them the opportunity to move from farm working to property management." Guerra said that Evolve will be partnering with nearby nonprofits like CAPACES to develop the leadership skills of the people in its training program, while Evolve staff will teach the technical skills necessary to become a successful property manager. "We want to offer opportunities to historical disadvantaged people: low-income farmworkers and families," Guerra said.